See the Leftover Ham Recipes shown below for ideas. 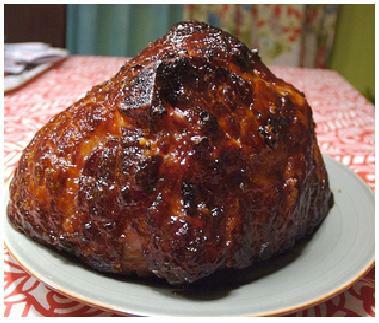 Also provided is a succulent dinner entree recipe for Whiskey Glazed Ham. You may need this to create the leftovers for the recipes shown below it. For hundreds more mouth watering American style recipes, visit any of the links shown below. The dish shown here is great for Leftover Ham Recipes. The sweet tender meat from this delectable Whiskey Glazed Ham makes for some tasty leftovers. Using a sharp knife, score the surface of the ham in a criss-cross pattern, making diamond shapes about 1/2-inch deep. Mix the bourbon, brown sugar, crushed pineapple, honey, and garlic in a VERY large ziploc bag, or sealable plastic container. Place the ham in the container with the marinade, seal the container, and refrigerate the ham overnight. Turn the container over several times while marinating. Be sure it is sealed! When you are ready to cook the ham, preheat the oven to 350 degrees Fahrenheit (175 degrees Celsius). Transfer the ham and marinade to a large baking dish. If you like, you can attach pineapple rings and cherries around the surface of the ham with toothpicks. Bake the ham for about 90 minutes, basting it occasionally with the sauce in the pan. Remove from the oven and let sit for a few minutes. This ham salad recipe makes a great gourmet sandwich. In a food processor, mince the ham, celery, onion, pickle relish, and pickle juice (or water). Stir in mayo until well-moistened. Add pepper, and stir in the chopped egg. Optional: Serve on soft rolls with lettuce. Serve french fries, pickles and sliced tomatoes on the side. Here's another leftover ham recipe that's super easy to prepare, and makes a particularly elegant presentation. In a large bowl, toss the asparagus in the olive oil, and season it with salt and pepper. Create a lightly floured surface. Roll the crescent dough into a large rectangular shape, and cut it into strips about a half inch thick. 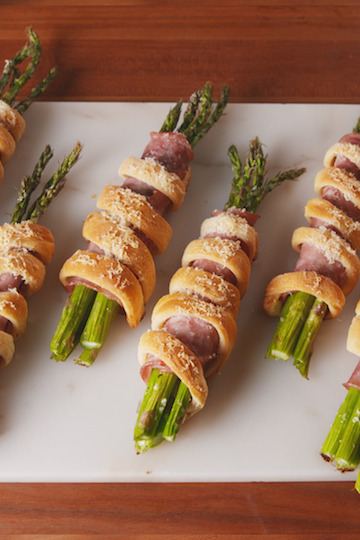 Wrap 4 asparagus stalks in a slice of ham, then spiral the dough around it. Place each bundle on the baking sheet, and top with parmesan cheese. Bake until the asparagus is tender and the dough is lightly browned, about 15 minutes. Hit this link for more Leftover Ham Recipes, and other Authentic Recipes From All 50 States. Go here to view the Main Entree Page.